Quantitative Data: This section provides secondary data on breast cancer rates and trends that include incidence, deaths and late-stage diagnosis along with mammography screening proportions. This section also explores demographic, social and geographic characteristics that influence breast cancer outcomes such as race/ethnicity, socioeconomic status, educational attainment and insurance status. Health Systems Analysis: This section tells the story of the breast cancer continuum of care and the delivery of quality health care in the community. Key to this section is the observation of potential strengths and weaknesses in the health care system that could compromise a women’s health as she works her way through the continuum of care (e.g., screening, diagnosis, treatment and follow-up/survivorship services). Public Policy Overview: This section provides an overview of key breast cancer policies that affect the ability of at-risk women in accessing and utilizing quality care. This section covers the state’s National Breast and Cervical Cancer Early Detection Program, the state’s National Comprehensive Cancer Control Program and the Affordable Care Act. 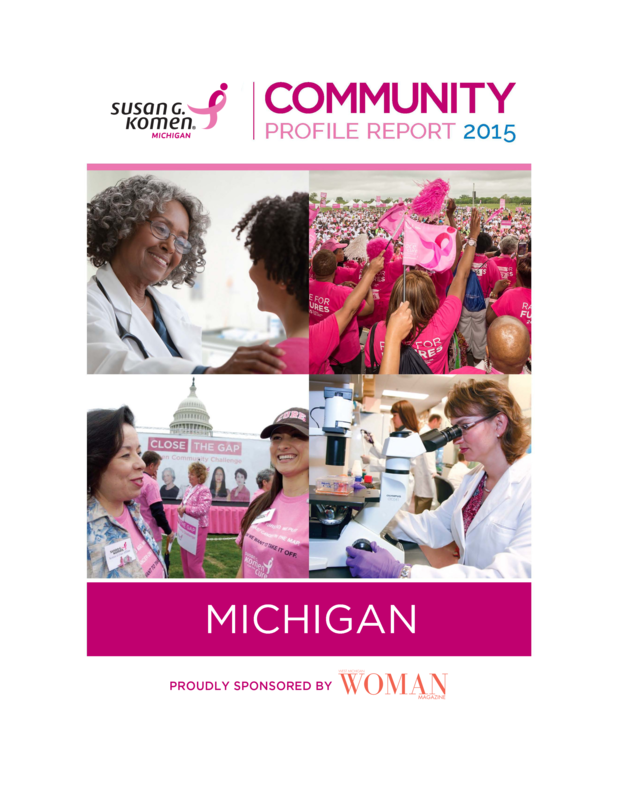 Special thanks to West Michigan Woman Magazine for sponsoring our 2015 Community Profile! To view the report, click the download button below. Download the full Community Profile Report here.